In Whitehall City Schools, our goal is for every student to grow into an active reader by the end of 1st grade. All preschool, kindergarten and 1st grade students in Whitehall City Schools attend our Kae Avenue Primary Literacy Campus where we strive to inspire our young learners to love reading! Welcome to an exciting time for you and your child, kindergarten! We are excited to serve your child, help him/her grow and succeed! 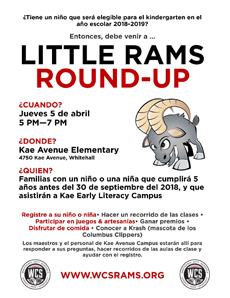 We Are excited to invite you to our 3rd annual Little Rams Round Up on April 5, 2018 from 5pm-7pm for the purpose of assisting families with enrolling their incoming kindergarten student. At this event, you have the chance to meet our teachers and staff members, tour a kindergarten classroom, play games, take a bus tour, and begin online enrollment with the assistance of an enrollment center staff member. Click HERE to view a printable flyer about the event. Click HERE to view in Spanish. Currently, our registration is open for the 18-19 school year. See below for details about beginning the enrollment process for your child NOW! You can begin the enrollment process for your child by clicking HERE and completing the online registration of your child. After completing the online portion, please call our enrollment center at 614-417-5129 to schedule an appointment with our staff to complete the process.